Brian McCauley has been the heir apparent to succeed David Podmore as president and chief executive officer at Concert Real Estate Corporation for several years, and he said people shouldn’t expect many changes when he assumes his new title on June 2. 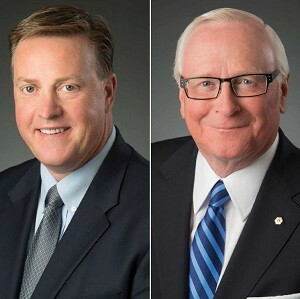 Concert Real Estate Corp.’s incoming President and CEO Brian McCauley, left, will replace David Podmore. “I’d like to think that there are opportunities to continue to grow, adapt and modify over time, but I’m fundamentally a huge believer in our core values and what we stand for and what we’re trying to do for our shareholders,” McCauley said. “I don’t see a significant shift away from our mandate, our focus and our business plan. Podmore co-founded Concert with Jack Poole in 1989 with a mandate to provide economically priced rental housing in British Columbia. The Vancouver-based company has since grown into a national enterprise with various entities, nearly $2.4 billion in committed equity, and more than $5 billion in owned assets and assets under management. Nearly 12,000 rental and condominium homes have been developed and 11.5 million square feet of income-producing property has been built or acquired. The next 15 years will see the development of approximately 5,500 condo suites, 1,500 rental suites, 600 seniors home units and 500,000 square feet of commercial property. McCauley joined Concert in 1994 and has played a key role in the development of some of the company’s largest mixed-use projects. He led the development of assured rental housing in Toronto in a joint venture with the OMERS pension fund in 2002, guiding Concert’s expansion into Ontario. McCauley became Concert’s chief operating officer in 2012. “A key interest on my part is to make sure that we’re looking to build the next generation of buildings at Concert,” said McCauley. Concert has four master-planned projects in Metro Vancouver at various stages of the development and approvals process. – and three boutique condo buildings will be available next year. Concert is also busy with several projects in Toronto. The 58-storey, 525-suite 88 Scott Condominium Residences at the intersection of the downtown financial district and St. Lawrence neighbourhood is topped off and will be turned over to purchasers in October. “It’s the largest single building project in Concert’s history,” said McCauley. The construction of the first of five planned residential towers at The Kip District, at Kipling Avenue and Dundas Street in Etobicoke, is underway. The 28-storey condo building with one- and two-bedroom suites is sold-out. Phase two will launch this summer. Sherwood at Huntington, an 81-suite luxury condo being built in partnership with Tridel at 1900 Bayview Ave., will be ready for occupancy next year. RioCan REIT (REI.UN-T) recently sold a 50 per cent stake in Sunnybrook Plaza, at the corner of Bayview and Eglinton avenues, to Concert for $26.3 million. They’ll redevelop the site, which currently contains 50,766 square feet of retail space, into a mixed-use property that will feature 16-storey and 11-storey rental apartments as well as 43,000 square feet of retail. Concert has also just acquired an Ontario site for a seniors housing development that will be revealed in the next few weeks. Podmore will continue as board chair for Concert Real Estate Corporation, Concert Properties Ltd. and the CREC Commercial Fund LP investment committee, as well as board chair and chief executive officer of Concert Infrastructure Ltd.
“What I can do is make sure we’re supportive of and responding to the plans and proposals that Brian brings forward,” said Podmore. The infrastructure division was created in 2010 and Podmore wants to spend a few years focusing on helping it grow. It has built 22 schools in Alberta that are operational and 18 more in Saskatchewan will be turned over to education authorities in June. Concert will maintain the facilities for a 30-year concession period. Concert Infrastructure Ltd. has also built and maintains 18 Ontario Provincial Police facilities and the 663,000-square-foot Forensic Services and Coroner’s Complex in northwest Toronto. All of these projects involved public-private partnerships. Concert is owned by union and management pension plans representing more than 200,000 Canadians. “We’re in very solid financial shape, we’ve got a really good pipeline of future opportunities ahead of us, we have an excellent team that Brian has put together to lead this, and we’ve got a lot of opportunities for continued growth,” said Podmore.